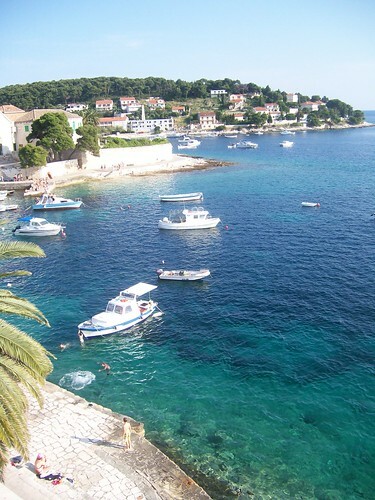 I'd been hauling my suitcase around for three and a half weeks by the time we reached Hvar. Tamra had joined me two weeks earlier. We both decided we were ready for a couple of days of down time and our location here couldn't have been nicer. So we adjusted our schedule a bit so that we could stick around longer than we'd planned. Hvar is a pretty little town - clean, quiet, and comfortable - with just enough to keep us occupied for a few days of kicking back and relaxing. As in most towns on the Dalmatian Coast area, the entire town is built of limestone - the roads, the walkways, and the buildings - so everything is white except the green plants and the startling blue water. Old Hvar begins at a promenade lining the small harbor and wrapping around a couple of points. From there it climbs steeply up a hillside and over the hill where our hotel was situated. We wandered the town's narrow streets - really not much more than paths - that allowed us to peek into the gardens behind the houses and get a feel for life in Hvar. We drank great wines but were disappointed that we couldn't find the wonderful Pecorino (sheep) cheeses that we had enjoyed in Italy. We ate a fantastic beef tenderloin meal, even though they had to move us and our table when it started to sprinkle. We also had a very expensive but mediocre "Slow Food" meal one night and a really bad undercooked (hard) risotto the next. Many times we walked past a seafood restaurant near our hotel that kept many of it's offerings alive until just before dinner time. I don't know why we never ate there, but seeing the live fish made us think about fishing. One day, we noticed a tourist stand set up offering boat rides to various nearby islands. Tamra fishes with Terry and I all the time, so we both know what we are doing with a rod and reel. We hadn't seen any fish in the water, but it was so clean and beautiful, we knew they must be out there somewhere. Besides, we thought it would be fun to go home and brag that we'd been deep-sea fishing in Croatia. The kid in the booth spoke English so we explained what we had in mind. It soon became apparent that he knew nothing about fishing, but we didn't care about that, as long as the boat captain did. It turned out that he had never arranged a fishing trip before but he told us to come back later that afternoon and he would have it all set up for us. When we returned at five, he greeted us with a big smile and proceeded to tell us what he had arranged for us. The following morning, we would go out in a small fishing boat for four hours. During that time, we would have the opportunity to experience four different styles of fishing: cast nets, bottom fishing, jigging with a hand line, and, finally, trolling. OK... so they obviously didn't get many people wanting to go sportfishing. They had absolutely no idea what we were talking about. I was surprised to see that Tamra still seemed to be considering the trip. She asked about the price, and when he told us that it would be 500 euros - over $700US - for that four-hour joke, we looked at each other and laughed before we walked away.